I've been critical of MLS in the past. Especially with their marketing campaign of trying to sell themselves as a top league, comparable to the ones in Europe or being at a higher level than Liga MX, Japan J-League, China Super League and other comparable leagues worldwide. This is not saying MLS is bad or not worth following, just that there is still growth needed. In the case of what moves are done behind the scenes influencing the league, they are sometimes good although in other cases for the worst, and unless MLS wants to follow China and give each club $200,000,000 to spend, the league is not magically going to become the top league in the world. One of the best ways of observing the quality and activities of a league is to follow the transfer market, keep track of players who are leaving, and understanding the history of new players coming into the league. Based on the structure of MLS, this always includes a lot of free transfers of players leaving that the league finds to expensive, not good enough and some players leave for greener pastures, while the same can said about free transfers coming in to the league. As I wrote in my top 20 players overlooked by the MLS, this year included young players with potential long term upside that MLS clubs have failed to either sell or resign, which includes high profile names such as Perry Kitchen from DC United, Luis Gil and Luis Silva from Real Salt Lake. The league also sold players this season outside of the league, including Matt Maizga of the New York Red Bulls, Kriztian Nemeth of Sporting KC, Obafemi Martins from Seattle and Juninho and Omar Gonzalez of the LA Galaxy. 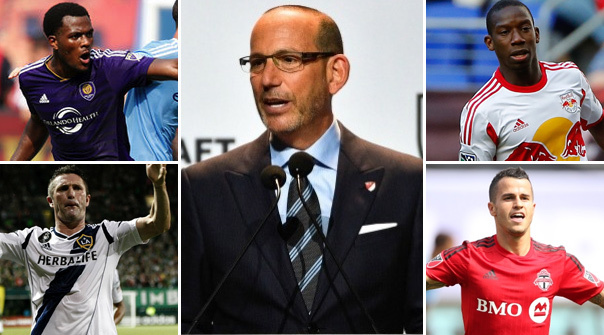 They didn't have the big splash buys, such as a Sebastian Giovinco, instead the top additions for 2016 have been Yura Movisyan at Sporting KC, Shkelzen Gahsi at Colorado, Ilsinho at Philadelphia, Luciano Acosta at DC United, and Ashley Cole, Nigel De Jong and Jelle Van Damme to LA Galaxy. Although these are interesting moves, they are not necessarily an improvement over the players who left, especially when you compare with the transfer dealings in Europe, Mexico and most noticeably China. Despite the lack of spending, and in some cases of questionable transfers brought in, I do feel the league is developing positively and I'm excited for the 2016 season. The main reason for my positive outlook is the general improvement in player development, be it from the Academies, players who played for MLS clubs’ USL affiliates, scouting other regions, or the long term effect of MLS existing, it all means more young players want to play the game professionally and the crop of young players coming into the league are exciting as it has ever been. It is also the teams that have developed this aspect of the game that excite me the most for the upcoming season and the future of MLS. Not surprising the three teams that excite me the most are also the biggest clubs in the league: LA Galaxy, New York Red Bulls and Seattle Sounders. In many ways, due to budget, these teams have always had the biggest advantage and until Toronto FC joined the group, these were the clubs that would bring the biggest DPs in. Even in 2016, the core of these teams include big names in MLS, however, it is their new group of young players who are not only exciting but cap-wise allow the clubs to spend more money on high profile players instead of trying to fill out a whole roster of average players, which some clubs have been in doing. The leader in this movement is the LA Galaxy, whose roster this year includes forwards Gyasi Zardes and Bradford Jamieson, midfielders Sebastian Lletget and Ema Boateng, defenders Oscar Soto and David Romney and keeper Clement Diop, which all players who would most likely be in the starting eleven of any other MLS side. Although with this extra cap room, LA were able to bring in Ashley Cole, Nigel de Jong, Jelle Van Damme, and free agents Mike Magee and Jeff Larentowicz. You add current DP's Robbie Keane, Steven Gerrard and Giovani Dos Santos to the mix and we could have our first "galacticos" in MLS and a team who can separate themselves from the parity that has controlled the league since its existence. The New York Red Bulls haven’t been as flashy, although if you followed American soccer closely or read my past articles, you would know that despite the first team success they have been very budget-conscious, while their youth team has been one of the strongest in MLS. This year the club brought in seven academy players into the first team with Brandon Allen, Alex Muyl and Derrick Etienne highlighting the group and potentially making an impact this season. They joined a club that was the top team in the Eastern Conference who now have Shaun Wright-Phillips and Gonzalo Veron for the whole season and added Ghanian International Gideon Bash. As mentioned, they did lose Miazga and I don't feel the new players fit in as well as they do with the Galaxy, but the Red Bulls should be a strong team this season and one who continues to be in the future. In the case of Seattle, the forced sale of Martins will hurt them and prior to that they had salary cap issues and were forced to let Marco Pappa, Leo Gonzalez and Lamar Neagle leave. However, they did bring in Joevin Jones, Michael Farfan and most importantly signed Jordan Morris to a Homegrown Contract. The Morris story was a big one this off-season and was about him first going to Europe or staying in MLS and then the contract of $250,000 a yaer that he supposedly signed for. Following Morris for years, first in Seattle USSDA program and then at Stanford, I do feel Morris has the ability to be an impact player in the league and if you add the fact that Seattle has him without costing anything against cap, it should give the Sounders the ability to sign another impact player or two this season to an already projected playoff team. The Galaxy, Red Bulls and Sounders are not the only clubs doing good development work and clubs have signed some interesting young players as well as taking advantage of loaning players in. Over at ProspectXI, we will be further documenting these new prospects. Additional young players to follow this season include Cyle Larin and Richie Laryea at Orlando, Justen Glad and Jordan Allen at Real Salt Lake, Collin Fernandez and Brandon Vincent at Chicago, Fraser Aird and Deiby Flores at Vancouver, Joshua Yaro and Fabian Herbers at Philadelphia, Carlos Gruezo and Jesse Gonzalez at FC Dallas, Daniel Salloi at Sporting KC, Jack Harrison at NYCFC, Lucas Ontivero at Montreal and Acosta at DC United. These players have an influence in predicting how each team will do this year, although players with past MLS and world soccer experience do as well. 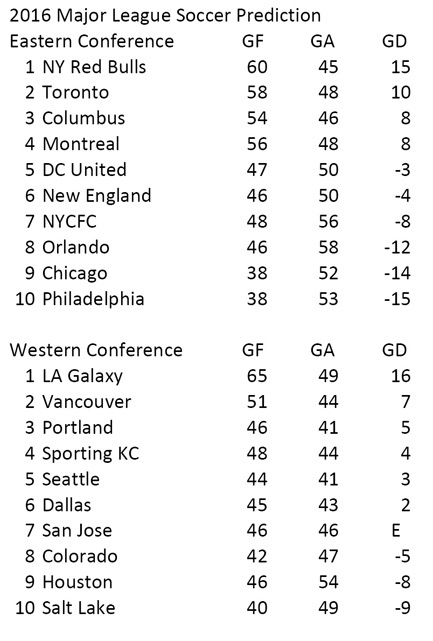 Although a team like Chicago, Philadelphia, Orlando, NYCFC, and Real Salt Lake will be interesting to follow because of these young players, the statistical model I use in predicting the season does not predict them as playoff teams in 2016. The model looks at individual players expected results for 2016, and try to predict how this collection will perform as a team. Last year’s model predicted 10 of the 12 playoff teams, although I did have Chicago making the playoffs and Montreal missing so not all players/teams perform as they should and the model is designed for ongoing and post evaluation of a club. The model sees a bit of drop off from Giovinco’s excellent performance last season, although he’ll still lead the league in goals plus assists. The model also predicts repeated strong goal scoring seasons from Keane, Larin, Kei Kamara, Didier Drogba, Dom Dwyer, David Accam, David Villa, Clint Dempsey and Fanendo Adi. New(ish) players to the league such as Movsisyan and Shkelzen are projected to score more than 10 goals, despite their clubs not making the playoffs. While Dos Santos, Gerrard, Mauro Diaz, Diego Valeri, and Andrea Pirlo are projected to join Giovinco as some of the top playmakers in 2016. When MLS came out a couple of years ago and said they were going to be a top league by 2022, I dismissed the idea not because the market potential in North America isn't there, or even that were incapable of developing players at the level. The reason I dismissed it is you can't manufacture success without the market believing in what you are doing. I knew MLS couldn't buy their way up like China is trying to do as a top league in the world, and we also don't have the history in the game as Europe, South America or Mexico has. Although what I do feel is if soccer and MLS can become people's favorite sport, and that if young athletes want to grow up as professional soccer players over other sports, than soccer and MLS will be in the same conversation as the other major North American leagues. At that point we can start comparing if MLS is equivalent to Liga MX, China Super League, Dutch Eredivisie or English Premier League. My understanding of the game and sports in general in North America tells me this will not happen by 2022, however, if the league continues to give opportunities to these young players to live out their dreams as professional soccer players, we will be heading in the right direction.